We spent our Labor Day weekend camping on the Delaware shore. It was our first family trip to the beaches of Delaware and I can’t wait to go back! 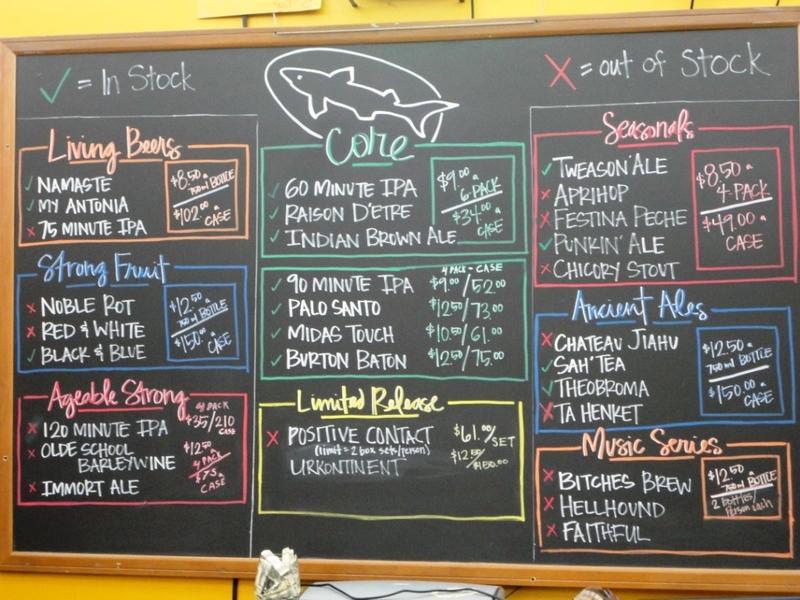 We camped at Cape Henlopen State Park, played for hours on the beach just a couple minutes from our camp site, walked the boardwalk on Rehoboth Beach, and savored fresh Dogfish Head craft brew. Does life get any better than this? 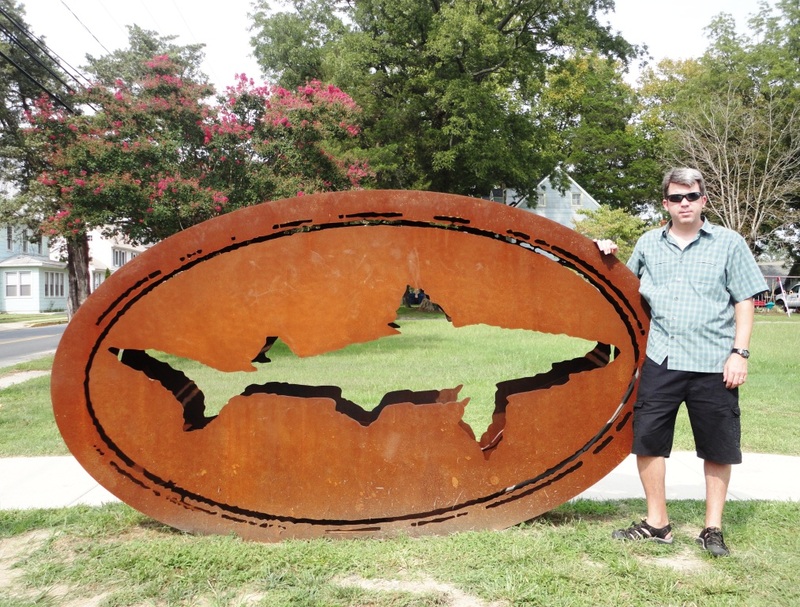 I was lucky to get Labor Day weekend tickets to tour the Dogfish Head Brewery in Milton, Delaware. Our Saturday tour time was 3:30 p.m., so we spent most of the day on the beautiful beach at Cape Henlopen State Park. 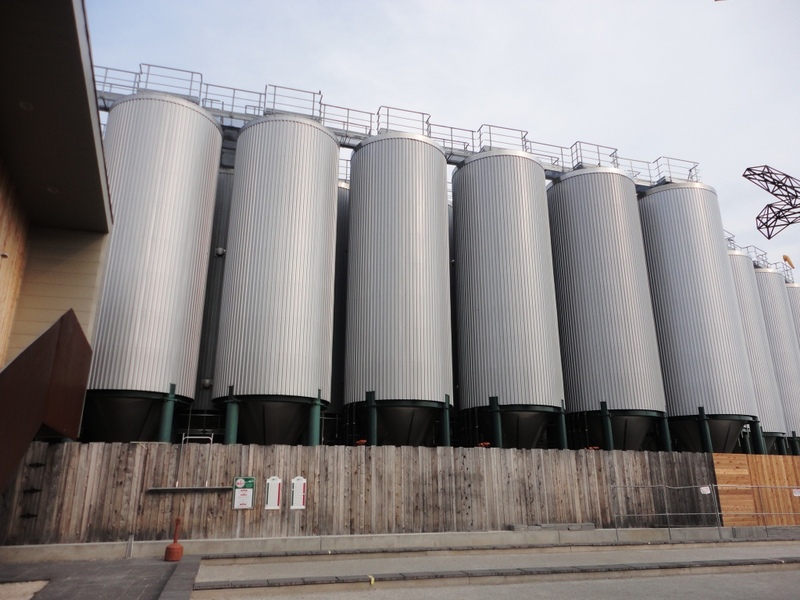 Swimming in the ocean and digging in the sand would normally leave me wiped out, but I was excited about visiting one of my favorite breweries, so after rinsing off the sand we made the 15-minute drive to Milton. 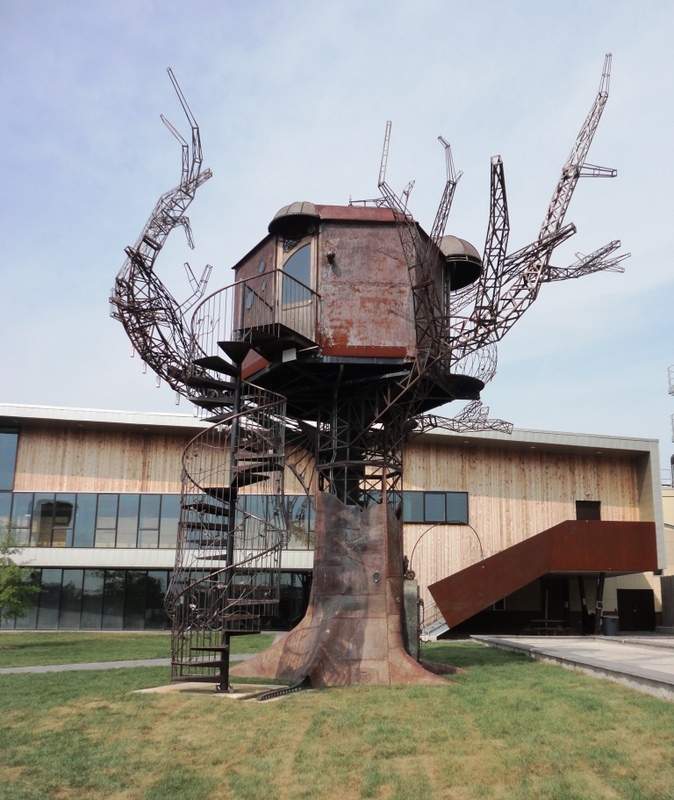 The first thing you notice as you approach the brewery is the large “Steampunk Tree House,” a 40′ tall functional piece of art placed on the lawn in front of the brewery. We heard some great stories about the Tree House during the tour. We entered the large tasting room/gift shop and checked in for the tour. 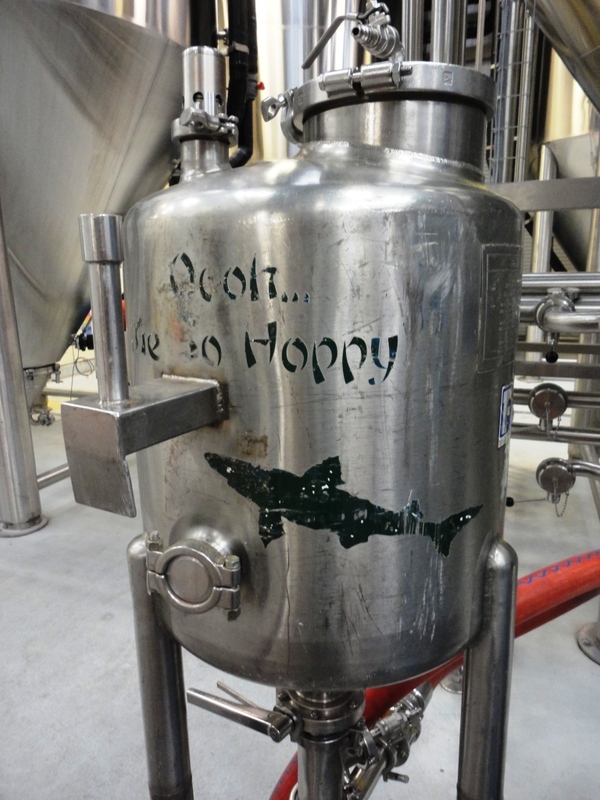 We were given four cut-out sharks, which we could trade for beer samples during the tour. The tour guide noticed our kids and he was happy to pour them homemade Beach Beer (birch beer soda) in place of the real thing. We started the tour in a back corner of the tasting room where we were treated to just-tapped Punkin Ale (7.0%), a full-bodied brown ale brewed with pumpkin meat, organic brown sugar, and spices. This is my favorite pumpkin beer – no other pumpkin brew can compare! My Antonia (7.5%), a continually-hopped imperial pilsner, was our second sample, and then it was time to walk through the brewhouse. 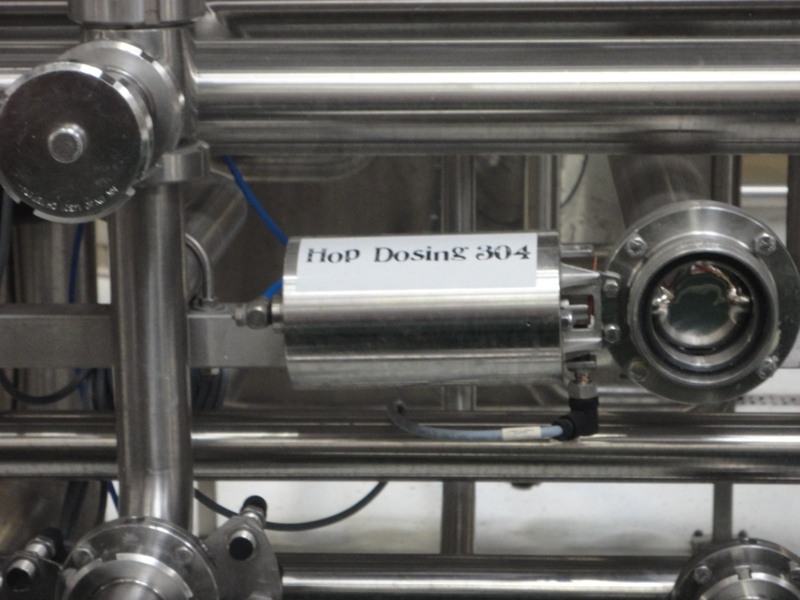 The brewhouse tour was typical of many brewery tours, with one major difference – the great stories about Dogfish Head founder and president Sam Calagione. He’s not only a great brewer, he’s also a marketing genius. 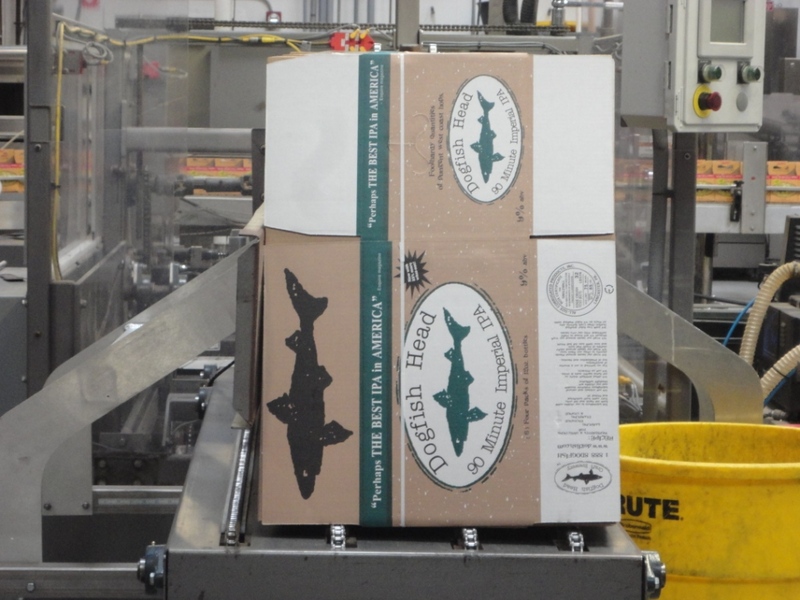 Maybe I was brainwashed by watching too many episodes of Dogfish Head reality-TV — Discovery Channel’s Brewmasters — but I love everything about Dogfish Head Brewery. Three words that come to mind: inspiring, genuine, and delicious! 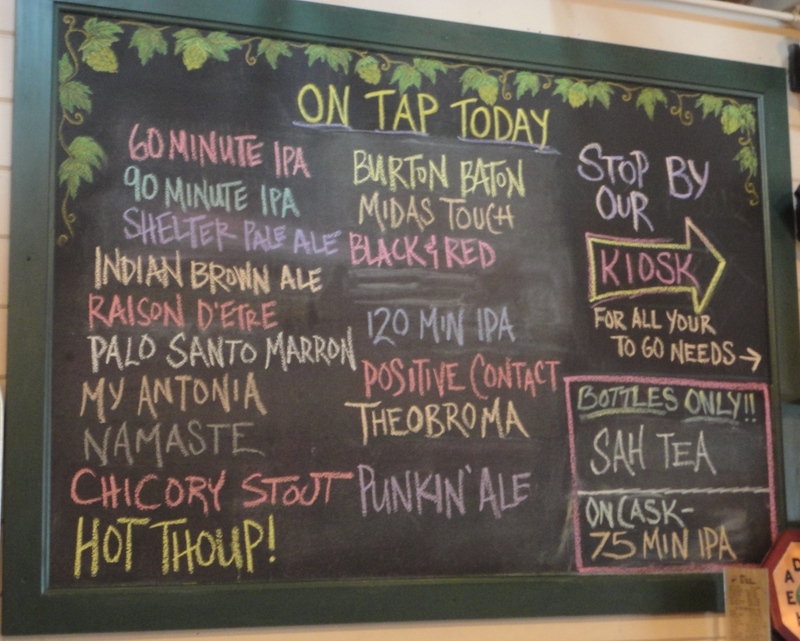 After the brewhouse tour, we made our way to the tasting room bar, where we were met with the classic 90 Minute IPA (9.0%). And since Beth doesn’t like IPAs, I got two samples! 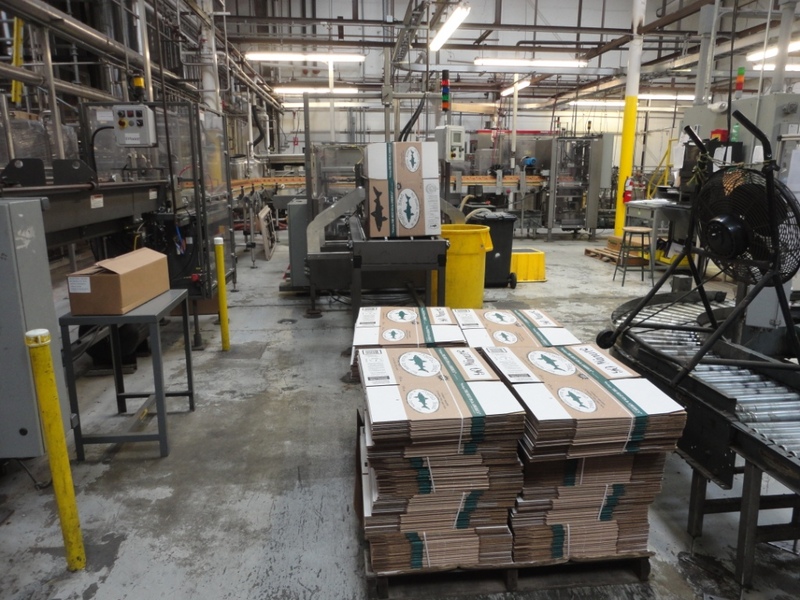 Our last sample was the rich and strong Palo Santo Marron (12.0%). 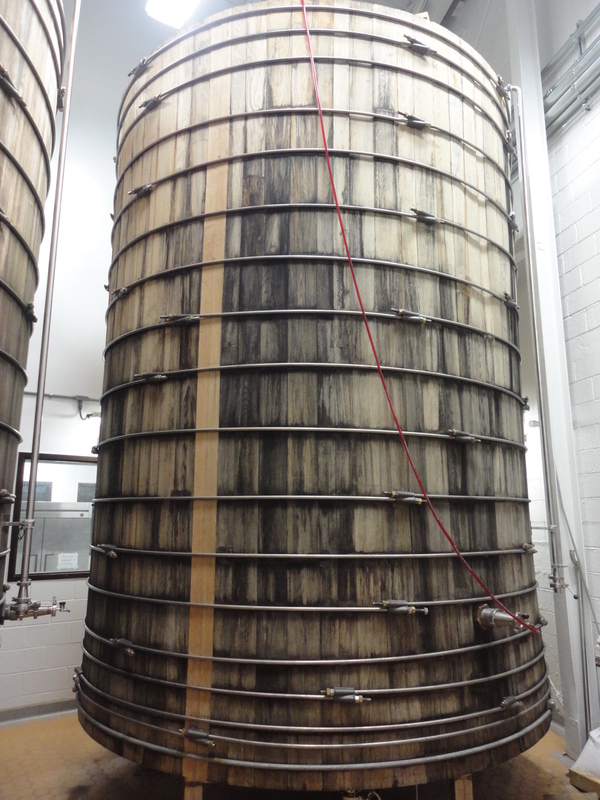 One of the highlights of the brewhouse tour was seeing where this beer is aged – the 10,000 gallon wooden tanks made with Palo Santo wood from Paraguay. This is a complex brew that Dogfish Head describes as “an unfiltered, unfettered, unprecedented brown ale.” What a great way to finish the tour! We left the brewery after spending $100+ on Dogfish Head brew and gear in the gift shop, and I say again: marketing genius. After a Sunday-morning pancakes and sausage breakfast, we headed south 10 miles to Rehoboth Beach. We rolled in early enough to find parking close to the boardwalk and spent a few hours playing arcade games and shopping for cheap souvenirs. 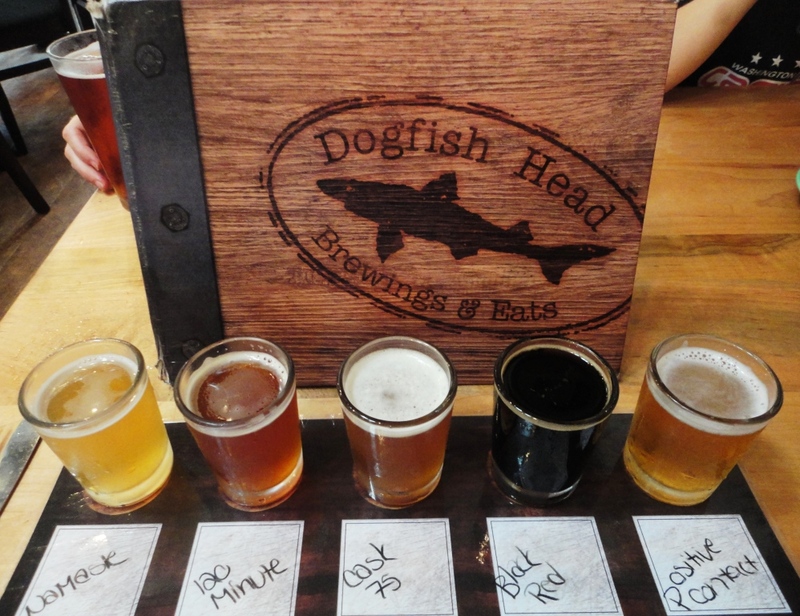 Time for lunch at the Dogfish Head brewpub, where it all began in 1995! Namaste (5.0%), a refreshing Belgian-style White made with dried organic orange slices, fresh cut lemongrass, and coriander. 75 Minute IPA (7.5%), a blend of 60 and 90 Minute IPAs on cask. 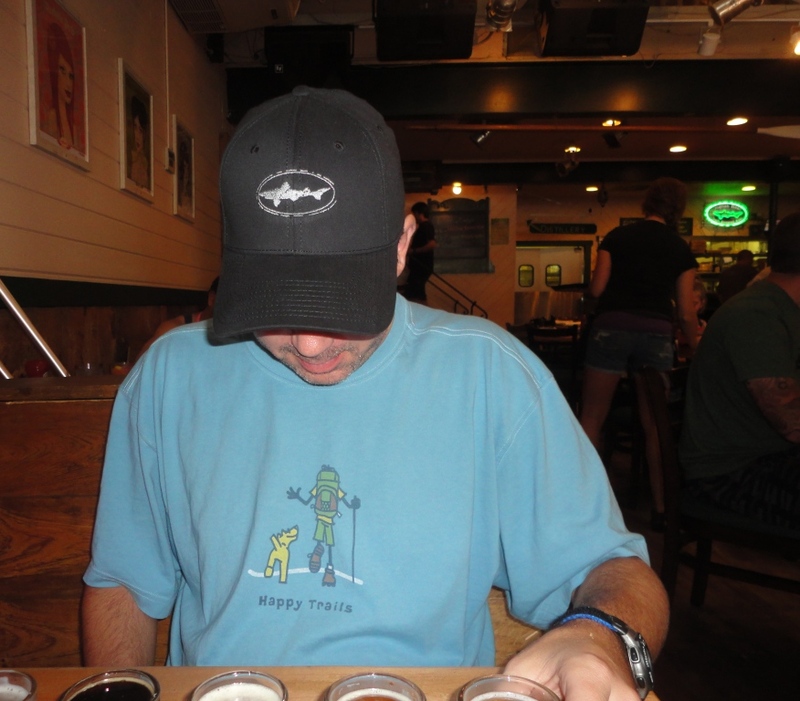 This was an incredible beer – my favorite Dogfish Head brew of the trip. After my sampler, I ordered a separate pint of this one. 120 Minute IPA (15-18%), “the world’s strongest IPA” was intense! Black & Red (10.5%), “a big dry minted stout with a serious fruit problem.” This beer was roasty, minty, and tart and I’m not sure I liked the combination – a sampler-size glass was enough for me. Even though the brewpub was packed, our service was awesome (glad we got there early!). The kids enjoyed more Beach Beer (birch beer soda) and we all loved our lunch. 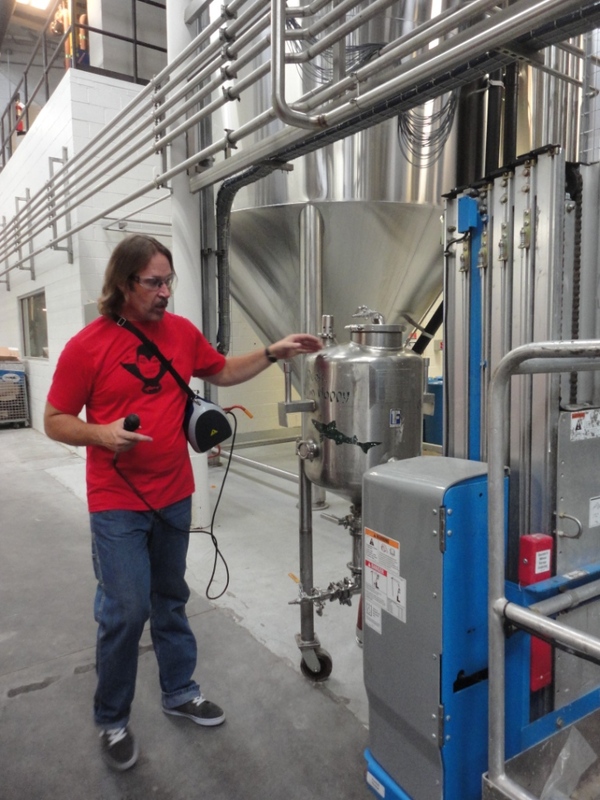 While digesting lunch, I took some time to check out the small experimental brewery and the 2nd-floor distillery where they make hand-crafted spirits. Nice writeup. I enjoyed the tour and pub last year. Nice folks.